Sara Pennypacker Peter and his pet fox are best friends. But one day, Peter is forced to release Pax into the wild. The two friends are heartbroken, and determined to find their way back to each other. 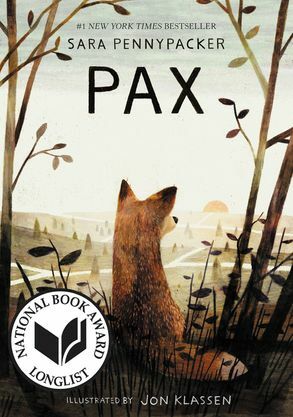 National Book Award Longlist * New York Times Bestseller * An Amazon Best Book of the YearFrom bestselling and award-winning author Sara Pennypacker comes a beautifully wrought, utterly compelling novel about the powerful relationship between a boy and his fox. Pax is destined to become a classic, beloved for generations to come.Pax and Peter have been inseparable ever since Peter rescued him as a kit. But one day, the unimaginable happens: Peter’s dad enlists in the military and makes him return the fox to the wild.At his grandfather’s house, three hundred miles away from home, Peter knows he isn’t where he should be—with Pax. He strikes out on his own despite the encroaching war, spurred by love, loyalty, and grief, to be reunited with his fox.Meanwhile Pax, steadfastly waiting for his boy, embarks on adventures and discoveries of his own. . . .